September 2014 – Damn, I Can Make That! Now that the nights are getting cooler, we can start turning to some cozy, spicy, comfort food. 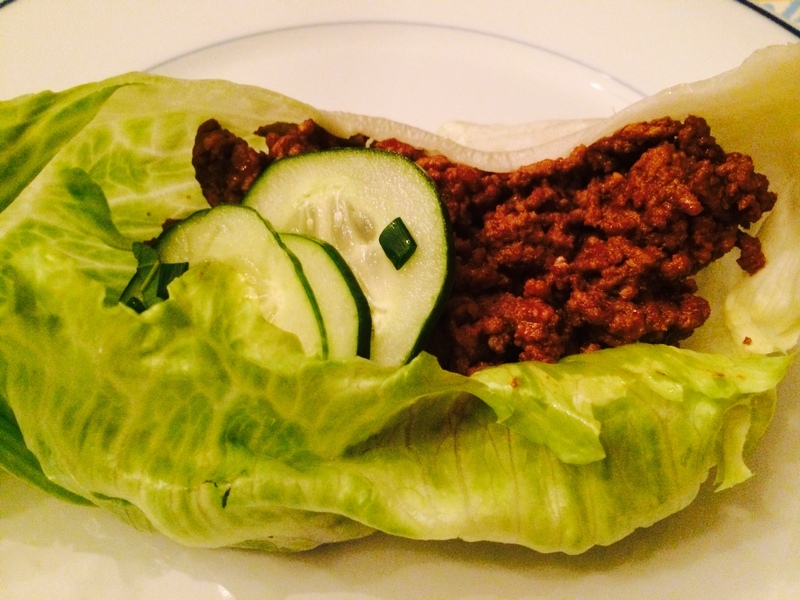 I’m not saying jump straight to the heavy chili, but you can definitely ease in to it with these lettuce wraps! They’ll make you sweat and cool you down all at once. Warning: Do not eat these in front of potential significant others! After seeing how messy these can get, they may not come back for seconds, if you know what I’m sayin’. Throw all of the ingredients for the pickles in to a jar or bowl and store in the fridge while you prep the wraps. For the wraps, heat the peanut oil over medium heat. Add in the onions, garlic, scallions, and meat and cook until brown. Slowly stir in all of the sauces – Sriracha, soy sauce, and rice vinegar. Cook until they’ve been absorbed by the meat, and serve immediately. Scoop the meat in to a lettuce leaf and top with the pickled cucumbers. The heat from the meat and spices, paired with the chilled pickled cucumbers will be like a party in your mouth! Dust off the crockpot guys, this is a Northerner’s solution to the Southern classic. Labor day has come and gone, so there is no denying colleges and universities are back in full swing. Just so you know my MBA classes have been started for two weeks already so don’t whine. Anyway, if you are a dorm dweller and are missing the lovely meals prepared for you while you were home or travelling for the summer, this is your post! Not only are these good microwave friendly recipes, but it actually uses and tastes like real food. What, are we still pretending like Easy Mac and Ramen noodles are “Real”? I am pretty sure my box of oreos and popcorn are more “Real”. Combine egg, egg whites, cheddar cheese, bell pepper, salt, and ground pepper in a microwave-safe mug coated with non-stick spray. Microwave on high for 1 minute; stir. Return to microwave and cook until eggs are completely set, 1 to 1 1/2 minutes longer. Sprinkle cheese on top and serve. Mix oats and milk in a microwave-safe bowl. Cook on high for 1 to 2 minutes, stirring once. Add more milk or oats to achieve the desired consistency, and cook for another 30 seconds. Stir in pumpkin puree, pumpkin pie spice, and cinnamon sugar. Heat for 20 more seconds and serve. Hope you enjoy and do submit any of your other dorm room delicacies. I am sure everyone else would love the help! Submit your recipe/tips to damndelish@gmail.com and receive a FREE tote if yours gets chosen to post. Check out our Instagram to see what the tote looks like. They are super cute and super useful!